So you’re trying to choose between two best of the bike computers in the world – the Garmin Edge 1000 vs 810? Tough situation! This post has all the information you need to decide. 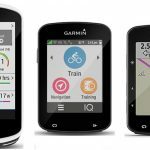 So How to Decide: Garmin Edge 810 vs 1000? There is a very significant price difference between these two computers. This is partly because the Garmin Edge 810 has been replaced by the Garmin Edge 820 (reviewed here). This chart shows all the most important similarities and differences between the 810 and the 1000. 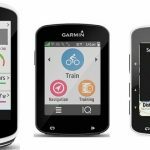 Alert: Garmin Edge 1000 is on sale right now (7 April 2017), discounted by $100. This hardly ever happens, so if you want the 1000, grab it while it lasts! The Edge 1000 and the Edge 810 have a lot in common. They are both bike computers that will give you tons of information: heart rate, power, speed, cadence, distance you have cycled, how much you have climbed, and so on. Note that some of these obviously require additional sensors. Something sitting on your handlebars cannot magically measure your heart rate, for example – for that you need a heart rate monitor that uses ANT+ compatible technology to connect to your Garmin Edge. Similarly, you need a speed and cadence sensor mounted on your wheel to send that data via ANT+ technology to your Garmin. Both the Edge 1000 and 810 offer automatic, wireless data uploads via Bluetooth and an app on your smartphone. And once y9ou upload them to your Garmin Connect app, they will then sync within seconds with your connected Strava account (if you have one). Both offer live tracking – which basically means that people can monitor where you are (but only if you invite them to). Both the Edge 1000 and 810 will function like a car Sat Nav (satellite navigation) system, recording where you have been and showing you how to go somewhere else. However, the basic maps they come with are very different. Of course, they both offer all kinds of features and training metrics to help you make your bike training more effective and structured. 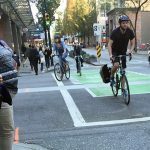 Both are rugged bike computers that will stand up to wind, rain, snow, mud and rough use. The only time I have ever broken a Garmin Edge was when I accidentally took it scuba diving. You can take a Garmin Edge anywhere – it’s as tough as you need it to be! Finally, both the Edge 1000 and 810 offer touchscreen navigation, which many users find to be a huge step up from button-operated bike computers. And it may be easier to operate for users who have become accustomed to the intuitive ease of touchscreen operation. As you can see, they have a lot in common, but there are some differences. Let’s take a closer look at the features of the Edge 1000 vs 810. Looking for a great #bike computer? Compare Garmin Edge 810 vs 1000. The Edge 810 bike computer offers a great range of connected features, including live tracking, sending/receiving courses, social media sharing, and weather updates. Live tracking means that you can invite people to be able to monitor where you are in real time. (You invite them using email or social media.) This could be very handy if you like to go for very long rides, and don’t want your spouse being worried about you. Or if you are a competitive cyclist and have a fan base that wants to keep track of your awesome performances. The Edge 810 comes with a very basic map that is basically almost useless. However, it is also compatible with optional detailed street or TOPO maps, so if you buy those, it can guide you while touring or commuting. It will also give you weather updates. You can also create routes on your computer and download them to your 810. Following a recent upgrade, the Edge 810 now includes turn-by-turn directions and off-course warnings as you cycle. The real strength of the Edge 810 is in its training support. It has a huge menu of training metrics that you can access by swiping through. 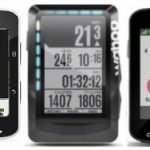 These include speed, altitude, power, heart rate, cadence, calories, gears (for Shimano Di2), time, distance, temperature, sunset time, workout counters, and more. Of course, these require various add-ons, including heart rate monitor, cadence sensors and power meters. If all this is important to you, you might want to consider buying a Garmin Edge 810 bundle that includes heart rate monitor and speed/cadence sensor. Both the 810 and the 1000 offer Support for Garmin Cycling Dynamics. This is a more detailed set of metrics for those who have dual-sending Garmin Vector power meters. Vector is Garmin’s pedal-based power meter that measures total power, cadence and left/right balance. It includes Power Phase (PP) and Platform Center Offset (PCO). Previously this was limited to the Edge 1000. However, thanks to a recent upgrade, the 810 also has Shimano Di2 gearing information now. This means that if you have Di2 Dura-Ace 9070, Ultegra 6870 Di2, or Ultegra 6770, you can buy a $60 Shimano wireless transmitter to plug into it. The unit will then transmit gearing data (privately) via ANT to the Edge 1000. So you get to see which gear you are in, displayed on your unit. Garmin Connect Real-Time segments used to be limited to the Edge 1000, but have now been extended to the Edge 810 (and the 510). You can create or find segments at connect.garmin.com, download them to your unit, and set up in-ride competitions. These segments are really clever and cool. You download the desired segment to your Edge 810. Typically it’s a very short course that people like to compete on (virtually). As you approach the start of the course, the Edge 810 gives you a Countdown, and then says “Go!” As you cycle along the course, the Edge 810 keeps you constantly informed as to how you are doing. For example, you have 500 meters to go, and you are 8 seconds behind the segment leader – can you pump up the power and own the course? You can choose to compete against overall segment leaders, or against your own connections. The latter choice can be nice if you live in an area with a lot of cyclists who are faster than you, and don’t want to constantly lose! You could even go out of your way to cultivate a lot of connections at a similar level to you, so that you have a decent chance in the race. Personally, I hate being beaten all the time, so I would go for that option. However, I know that a lot of the people who buy the Edge 810 are going to be elite athletes, and for them, competing against the fastest and the best could be a great training option. In response to user requests, Garmin finally linked up with Strava (which many believe to be the best cycling app going. I love it so much I even bought the premium version, instead of staying with the free version). Read more about Strava here. 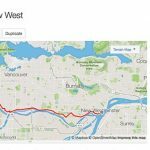 If you have the premium version of Strava, you can download Strava segments to your Garmin Edge, and use them to add some fun and motivation to your bike rides. Previously this was limited to the Edge 1000. However, thanks to a recent upgrade, the 810 also offers support for a tiny Garmin remote control with three buttons. One is for marking laps; one is for scrolling between data pages as you ride; and the third can be programmed for a function that you find important. You can attach this to your handlebars in the same way you attach your Garmin – and you don’t have to worry much about rain or batteries, because it is waterproof to 50 m and the battery should last for over a year. Why would you want a remote control? 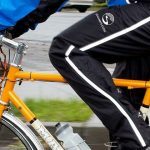 Primarily, these will be useful for those doing intense biking (such as downhill mountain biking) who cannot afford to take their hands off the handlebars. The Garmin Edge Remote control will cost you an extra $50. Now let’s take a look at what the top-of-the-line Garmin Edge 1000 offers. The Garmin Edge 1000 is the latest in the Garmin Edge line-up, and was released in mid-2014. This is an area where there are still significant differences between the Edge 1000 vs 810. First, the Garmin Edge 1000 has all of the navigation features of the Garmin Edge Touring – which was a revolutionary upgrade in bike navigation computers. The maps on the Garmin Edge 1000 are far superior to those on the 810. As noted above, the 810 comes equipped with a basically useless base map. However, on the Edge 1000 the preloaded Garmin Cycle Map includes OSM (Open Street Map) content, offering on-road and off-road navigation and points of interest, and address search. Map updates are free, and the maps are stored on the unit, so you don’t have to be connected to use them. Just as with the Garmin Edge Touring, the turn-by-turn navigation directions are excellent. And as with the Touring model, you are alerted by beeps and a countdown when a turn is coming. As with a car GPS, your upcoming route is highlighted, and the unit will recalculate if you deviate from the route it has planned (or you have planned). Like the Edge Touring, the 1000 offers round trip routing (you tell it you want to go for a 30 mile ride, and it suggests three possible routes you could try). This feature is not offered on the 810. This may or may not be important for you. Personally, I have never used it, but I know there are people who find it fun. The Garmin Edge Touring is reviewed in-depth here. So, with the Edge 1000 you get the training capabilities of the Edge 810, plus the built-in maps and navigation features of the Edge Touring. That goes some way towards justifying the higher price tag (given that the Edge Touring is $300, and the Edge 810 is $400). The Edge 1000 has a new, larger, high resolution full color screen. If you compare the Edge 810 vs 1000 side by side, they look very different. The 1000 is significantly taller, and now looks a lot more like a computer or smartphone, because of the clean appearance and the icons. Surprisingly, the 1000 is quite a bit thinner than the 810, even though it has more features. Here is the Edge 1000 in landscape mode, showing off the icon-based interface. Like the Edge 810, the 1000 integrates Shimano Di2 gearing information. However, this is extended in the 1000, in that the hidden shifting buttons on some Di2 systems can be used to remotely change display fields. See above under 810 for more details of this feature. As detailed above in the 810 section, the Garmin Edge 1000 enables you to use Garmin Connect Real-Time segments. 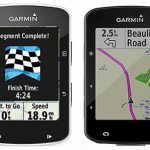 The 1000 was the first bike computer in the world to do this, but Garmin has now extended this to the 810 (and the 510). This is only good sense, as it means there is a bigger community of users to compete against. Previously this only offered on the Edge 1000, but it has now been extended to the 810 (and the 510 as well). See above under 810 for more details of this feature. Following upgrades, the 510, 810 and the 1000 now all offer Support for Garmin Cycling Dynamics. You can add the resulting additional metrics data displays to your unit on the 510, 810 and the 1000. However, the 1000 also enables you to add a dedicated Cycling Dynamics page with a much more graphical view of the metrics. See above under 810 for more details of this feature. The Edge 1000 has a training calendar. You can plan and schedule advanced workouts on Garmin Connect, then download them to your training calendar on your unit. As with all major purchases, it comes down to what you need and want. If you really need maps, then you might want to keep in mind that the 810 comes with a fairly useless base map, so you have to pay extra for better maps. So if you really need useful maps, you might opt for the 1000. The main reason I could see for spending the extra two hundred dollars for an Edge 1000 would be if you really need both high-end training metrics and high-end maps and navigation, out the box. In that case, you would need the Edge 1000. However, the notifications of incoming calls and messages offered by the Edge 1000 might be important for some people. For example, if you have an important job or run your own business, and notifications of incoming texts and calls are vitally important. I could imagine a heart surgeon would want to know if an urgent surgery was suddenly required, or a mid-wife might want to know right away if her services were required at an imminent birth. Also, if the speed of satellite acquisition is important to you, and you can afford to pay for a bike computer that finds satellites with blistering speed, then you would probably choose the Garmin Edge 1000 over the 810. If you are like me and find it hard to see tiny map displays, then the Edge 1000 would definitely be a better choice. 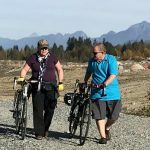 This will probably be relevant to a lot of cyclists who are over 40, and don’t want to wear cycling bifocals. It comes down to what you need and can afford. It’s a tough choice, but somebody’s got to make it!